Let It Ride is a variation of five card stud where the player wagers on a poker hand consisting of three cards in the player's hand and two community cards in the dealer's hand. The payout is determined by the ranking of the player's hand and the payout schedule. Each player places three equal bets in three spaces labeled (1),(2) and ($). Some casinos offer an optional $1 side bet. This side bet offers an additional payout if the player's first three cards contain a winning hand. Each player receives three face down cards. The dealer receives two cards face down. Each player is required to keep the three cards in full view of the dealer at all times. After looking at his three cards, each player has the option of pulling back the first bet or leaving the wager there. To leave the bet live is to "let it ride". The dealer then exposes one community card. The players each have the option of pulling back the second bet or letting it ride. After each player decides whether or not to pull back the second bet, the cards are placed face down on the designated area of the layout and may not be touched again. The dealer then turns up the second community card and in a counterclockwise direction, turns the three cards of each player face up. 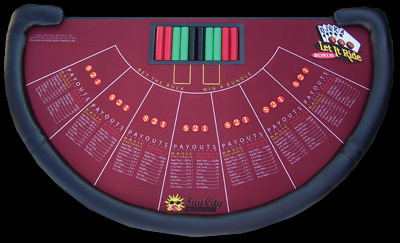 All losing wagers are then collected, and then all winning hands are paid by the dealer according to the payout schedule. Regardless of the decision made concerning the first or second bets, a player may not take back the third bet. Players are not allowed to show their hands to the other players, as this gives them an advantage by increasing their chances of knowing what cards the dealer is likely to turn up. In many casinos this is often not enforced at all. At a full table, it is sometimes difficult not to see the cards of a player on either side of you.